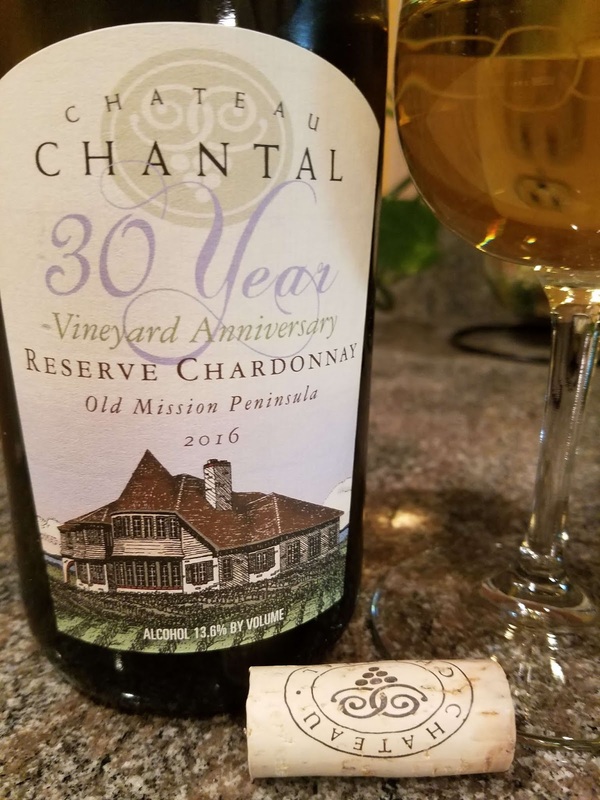 The final segment of the #WineStudio - Michigan Wine Collaborative presentation featured a pioneer in that state's wine industry: Chateau Chantal Winery. In 1983 Robert and Nadine Begin purchased 60 acres of cherry orchards in the Old Mission Peninsula to form the foundation for Begin Orchards. They quickly diversified into winegrapes and planted various grapes varieties including Chardonnay -- planted in 1986. Fast forward to today and Chateau Chantal is not only a respected winery but also a hospitality center with a B&B and rooms for executive retreats. In addition, those 30+ year old Chardonnay vines are maturing nicely and were recently the sole vintage in the Chateau Chantal 2016 30-year-vineyard Anniversary Reserve Chardonnay ($30). 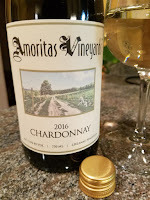 This barrel-fermented wine is very representative of Michigan Chardonnay with layers of lemon, peaches, green apples, creamy texture, slight vanilla, and finishing with lifting acids. A delicious wine. Cheers. Writing this during another cold and soggy morning I can't wait any longer for Spring - at least it may be a warm soggy morning. 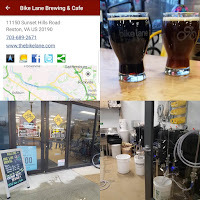 But Spring also brings bicycle season particularly trips along the W&OD Trail visiting Virginia breweries using theCompass. 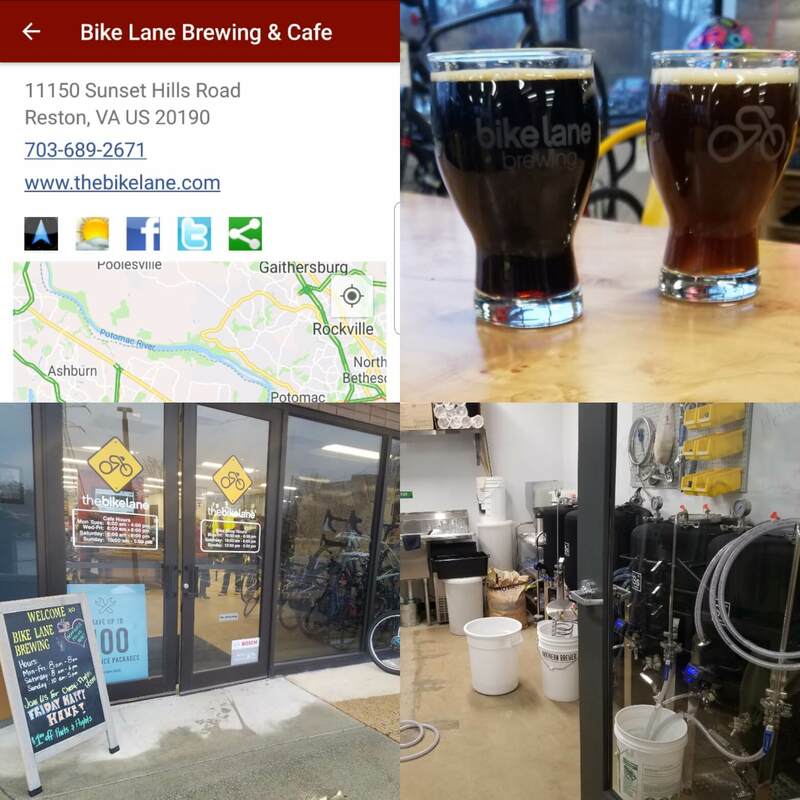 These trips include a new stop as The Bike Lane bike shop has expanded into Bike Lane Brewing & Cafe. This facility is located at mile marker 16.5 on the WO&D Trail and by vehicles on Sunset Hills between Whiele and Hunter Mill Road. Co-owner Todd Mader is the head brewer and brews small badges beyond a row of new bicycles. 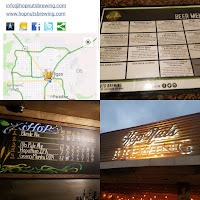 I'm looking forward to the Chamois Cream Ale during rides but on this cold visit I stuck to the roasty The Love Oatmeal Stout and the clean grapefruit of the WOD A Ride IPA. Because of the its nano status expect weekly changes to the lineup. Cheers and safe travels. 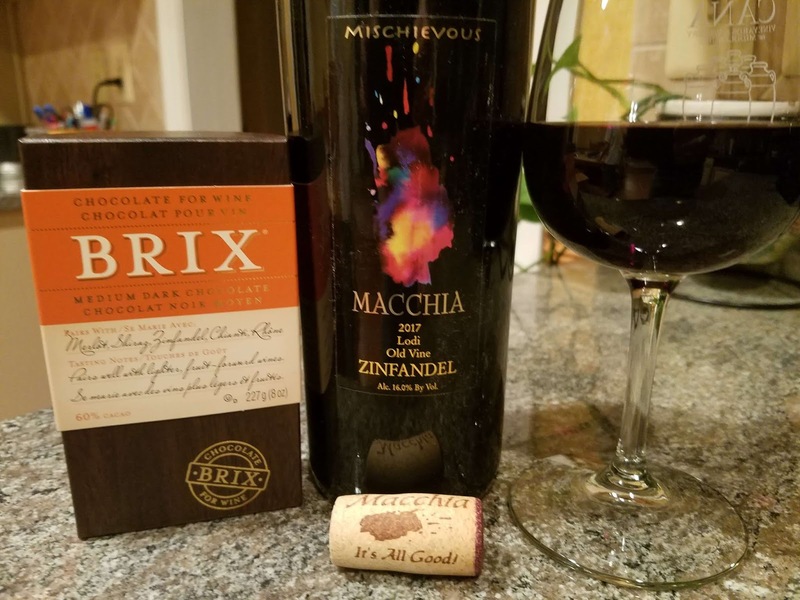 Earlier this month the Lodi Winegrape Commission hosted their annual Wine & Chocolate Weekend where attendees received one ounce of 60% cocoa Medium Dark chocolate bar from BRIX Chocolate to pair with various wine. This chocolate was intentionally created to be paired with red wine and is "composed of a base of single origin Ghanaian chocolate which is known for its unique red fruit tones. Thus BRIX works to evoke subtle flavors and nuances in the wines it is paired with, thus complementing them rather than competing against them." 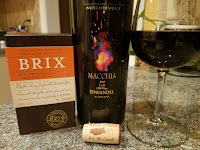 Belatedly we received a sample of the chocolate as well as a bottle of Macchia Wines Mischievous 2017 Lodi Old Vine Zinfandel ($22) to evaluate this pairing. The Mischievous is a typical fruit-forward Lodi Zinfandel produced from grapes harvested from 50 to 100-year-old vines. It was blended with some Petite Sirah to add structure and complexity. On its own, it is quite delicious. Then add the BRIX. Interestingly the chocolate is not only named for the wine term that indicates the amount of sugar in wine grapes but also comes as a solid brick. In the end, we decided to shave a little sliver into the glass - and the chocolate character blended seamlessly with the wine's fruit structure. A complete match. Fantastic. We then experimented with pairing the Zinfandel with a Hershey's Kiss and 85% German chocolate. Not even close. The darker chocolate was too bitter and clashed with the wine's fruit character and the Hersheys overwhelmed it. Instead of competing with the wine, BRIX is a solid complement to the Mischievous. Cheers. February's weekly #WineStudio twitter chat is focusing on Michigan Wine and the non-profit collaborative Michigan Wine Collaborative (see intro post here). The second week focused on two wineries St. Julian Winery from the ‏Lake Michigan Shore AVA and Amoritas Vineyards from the Leelanau Peninsula AVA -- most notable in that St. Julian is Michigan's oldest and largest winery and Amoritas is a relative newcomer. Family-owned St. Julian Winery has been operating since 1921 when Italian emigrant Mariano Meconi founded Border City Wine Cellars in Ontario at 26 years of age. Following the repeal of Prohibition, he moved across the border into Detroit and then eventually to the winery's current location in Paw Paw while changing the name to The Italian Wine Company. In 1941 the operation was christened St. Julian Winery to avoid any antifascist sentiment and to honor the the patron saint of his native village, Faleria, Italy. For the next eight decades St. Julian has facilitated the growth in the Michigan wine industry through the emphasis on hybrid and fruit wines to the more recent single varietal viniferia wines. Last week, winemaker Nancie Oxley presented two of these single varietal viniferia wines, a Riesling and a Grüner Veltliner. The 20 acre Mountain Road Estate was planted in the late 2000s by David Braganini, third generation owner of St. Julian Wine Company and his brother John Braganini. This estate lies upon porous sandy soils and experience warm sunny days transitioning to cool evenings - very suitable for retaining acidity in wine grapes. Starting in 2015 the Riesling harvest was whole clustered pressed resulting in less juice but higher quality which was then inoculated with a yeast strain used mostly for Sauvignon Blanc. Fermentation is stopped at 1.1% residual sugar to balance with the enhanced acidity. The result is a weighty wine, full of citrus flavors, slight petrol and loads of refreshing acidity. In 1967 Ed & Phyllis Oxley purchased a farm located on the highest point in the county and planted with grapes and tart cherries. This elevation provides abundant drainage and diurnal temperatures for the 100 acres of wine grapes which include Grüner Veltliner. These grapes are cold fermented - lengthening the process to enhance aromatics and acidity. And separate picking provides both tropical and grassy elements. The result is a delicious wine, with citrus aromas, tropical fruit, and racy acids. Showing its pedigree, the previous vintage was awarded the 2017 Jefferson Cup for White Vinifera Wine. 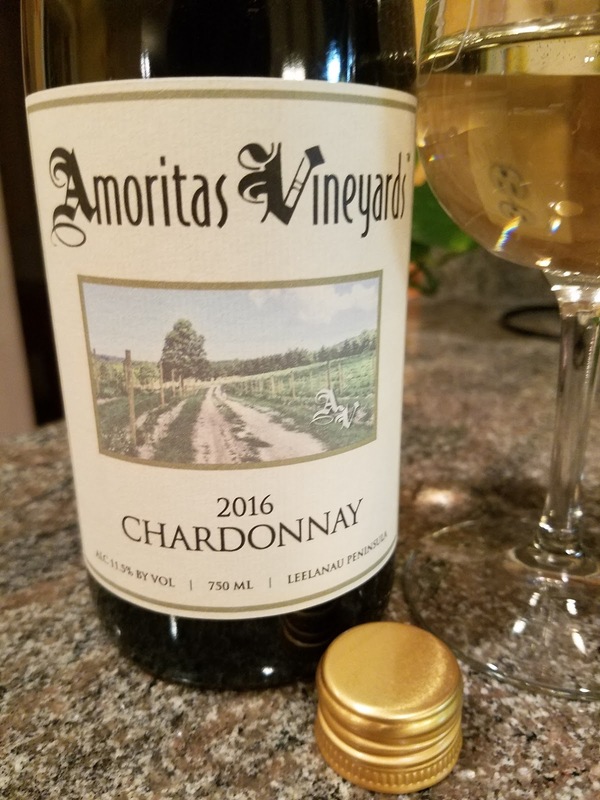 Amoritas Vineyards is a 150 acre estate located in the Leelanau Peninsula AVA - home to Michigan’s first wine trail. The estate consists of rolling hills and sandy loam soils providing a very suitable climate for wine grapes. 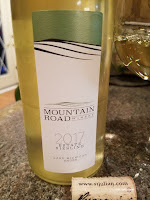 Initially the Goodell family sold fruit to other vineyards but more recently they have begun releasing small production single varietal wines. During our #Winestudio session Viticulturalist Emily Goodell presented their 2016 Rose Crest Vineyard Chardonnay - the first harvest from vines planted three years previously in 2013. This unoaked wine provides typical Chardonnay descriptors of soft apple and citrus with subtle minerals and refreshing acidity. Nicely done particularly from such young vines. For more on Michigan wines participate in the final #Winestudio session on February 19th 2019 at 9PM E.T. Cheers. The Valley View Vineyard is a 35-acre hilltop vineyard in Santa Barbara County's Santa Ynez Valley. Lucas & Lewellen Vineyards grows several Bordeaux grape varieties on this south facing vineyard which overlooks the Santa Ynez River primarily because it is slightly warmer than in neighboring eastern and northern appellations. On the lower plots, Cabernet Sauvignon calls home whereas Cabernet Franc, Petit Verdot, Merlot, and Malbec are planted. 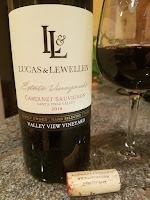 These grapes provide the juice for their excellent 2016 Valley View Vineyard Cabernet Sauvignon ($25) - a 75% Cabernet Sauvignon wine filled in by these other grape varieties. Why just 75%? According to wine-maker Megan McGrath-Gates, each varietal input adds their distinctive "personalities" to the finished wine. And after aging 21 months in 100% French oak barrels, the resulting wine provides fresh dark fruit, earthy tobacco, and a long juicy, tannic tail. A true bargain at this price point. Cheers. When visiting Las Vegas, it's usually a wise idea to leave the casinos and partake in the surrounding environment. After touring the Grand Canyon, Hoover Dam, and Red Rocks turn to the local craft beer scene. 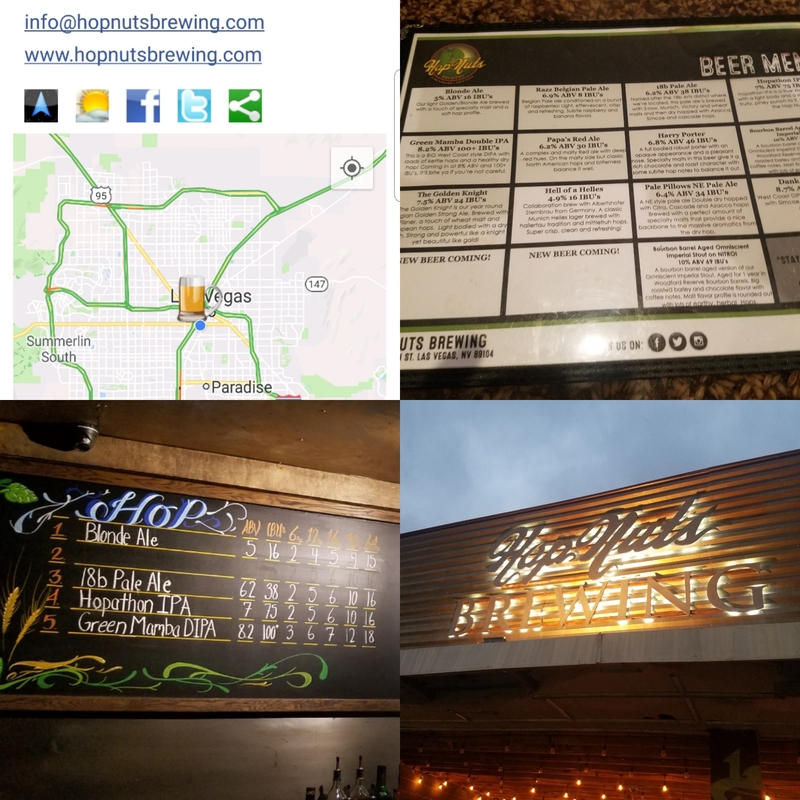 One suggestion is Hop Nuts Brewing - located in the Downtown Las Vegas Arts District. The tasting room is long and dark - providing a dive bar feel - with plenty of craft beer on tap. These included several styles of IPAs, Lagers, and Saisons. I started with small pours of the robust Bourbon Barrel Aged Omniscient Imperial Stout (10% ABV 69 IBU’s) and the smooth Harry Porter (6.8% ABV 46 IBU’s). The former was aged one year in Woodford Reserve Bourbon barrels and the whiskey profile dominates the chocolate coffee. On the other hand, the chocolate dominated the porter. However, my serial beverage was the Hell of a Helles (4.9% ABV 16 IBU's) a collaboration with Albertshöfer Sternbräu. This is a clean and fresh beer - spot on inviting easy and probably exceeding consumption. And as always, theCompass Craft Beverage Finder will guide you to any craft beverage destination. Cheers. 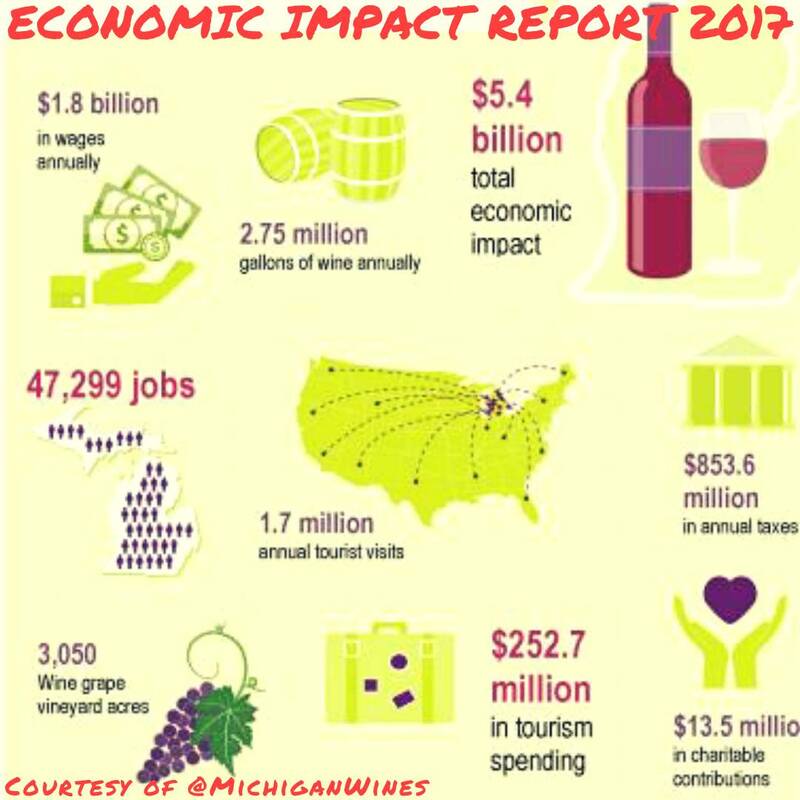 Those who have been following the Drink Local Wine scene know that Michigan has a thriving wine industry. To others, this may come as a complete surprise. According to Michigan Wine and theCompass Craft Beverage Finder, there are 180 winery tasting rooms operating in the Great Lakes state. These wineries produce 2.75 million gallons of wine per year from 3,050 vineyard acres which represent $5.4 billion in total economic impact. And according to the TTB, Michigan ranks 14th by state in bottled wine production. But a relatively new organization, the Michigan Wine Collaborative, is trying to improve that number. 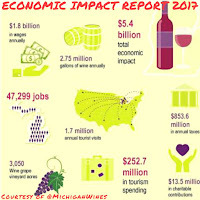 This non-profit collaborative has a goal to "enhance the sustainability and profitability of the Michigan wine industry by supporting wineries, growers and other businesses and individuals connected to the industry...". And one avenue for promoting the Michigan wine industry is through the weekly twitter forum #WineStudio. On February 12th and 19th (9PM E.T.) participants will be learning and discussing wine from St. Julian Winery ‏Lake Michigan Shore AVA, Amoritas Vineyards Leelanau Peninsula AVA, L. Mawby Winery Leelanau Peninsula AVA, and Big Little Wines Leelanau Peninsula AVA. So why should you participate? First, the state is dissected by the 45th Parallel -- the famed imaginary line that runs through Italy's Piedmont region; the Rhone Valley and Bordeaux in France; the Willamette Valley in Oregon, and the Leelanau Peninsula in Michigan. The latter is home to the Leelanau Peninsula Wine Trail - perhaps the most prolific region in the state. Each wine region is unique but along the 45th Parallel vineyards receive the same angle of the sun and length of day. 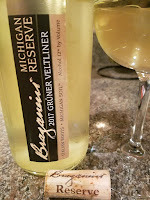 Second, Michigan also produces a wide range of wine styles from dry to ice wine, from viniferia, labrusca, and hybrid grapes to cherry and apple wines and cider. Like Rhone, Pinot grapes are prevalent as in Pinot Noir, Pinot Gris, Pinot Blanc, and even Pinot Meunier. Other cold climate grapes are Riesling and Gewurztraminer plus Chardonnay, Cabernet Franc, and Merlot (see Bordeaux reference above). Finally, you can learn how the cold climate nature of Michigan increases threats from spring freezes, winter burn, and mildew pressures from Michigan's high level of precipitation. This is amplified in tight cluster varieties such as Chardonnay and Pinots as wind flows are less likely to help dry the grapes. See you online. Cheers.